New building. New classes. New future. CLASSES: All our Fall 2015 classes are available for enrollment at this time, but hurry because many of the most popular class are filling fast. Visit https/app.thestudiodirector.com/mooresvillearts/portal.sd?page=Enroll&meth=search to enroll today. You may enroll online and attend class that same day, if you wish. In addition to expanding all our fine arts and dance department offerings for our younger students , we have also added many adult level classes. We currently offer Yoga, Ballroom, Tap, Jazz, Ballet Fitness, Pointe, and Workin’It Wednesdays to the schedule, as well as, our Life Drawing Group and Introduction to Watercolor. Workshops and events are also planned for the new Community Room space in the coming months. Plein Air painting, free art activities, music, dancing, and dramatic performances, as well as food from local vendors and art displays by local artists, all at the new Mooresville Arts Partnership in Mooresville! Plein Air painting check in begins at 9am and continues throughout the day--come paint or come watch the artists at work! At 10am other events will begin--free art activities for all ages, performances by musicians and dance groups, canvas & cookies, art demonstrations, and more! There will be food from local vendors and artists' work on display and for sale! All plein air check in and festival activities will take place on the grounds of the new The Mooresville Arts Partnership building, 697 Indianapolis Rd, Mooresville IN 46158. From there, painters are welcome to explore the town and local parks for subject matter of their choice or remain on grounds. 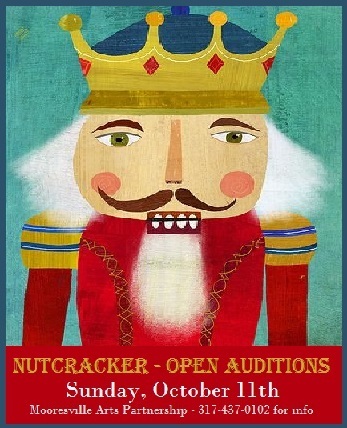 Open Audition for the Mooresville Arts Presentation of Nutcracker Celebration be will Sunday October 11th. Dancers, tumblers and performers of all ages are invited. You need not be a current MAP student or company member to audition. Please arrive at the posted arrival time to complete Registration Forms and to complete the registration process. Audition viewing is closed and the parent hospitality area will be available outside the studio. Parents will have the opportunity to sign up to volunteer for a committee. Your dancer will be released at the end of auditions. Please plan to promptly pick your dancer up then.